I’ve had this planer for almost 2 years now so I’ve had plenty of time to make up my mind I think. I got it as a package with the add-on tables and an extra set of blades. Out of the box all I needed to do was get the tables attached and it was ready to go. One thing to know going into this you need something to direct the chips off of it. The chip blower REALLY works and wood chips will be flying all over. I made the mistake of using it without anything and it looked like a tornado in my shop. I have mine hooked up to a single stage dust collector and that works pretty well. The blades are outstanding, I’ve ran god knows how many board feet of rough dirty white oak through it and I just flipped the first set around 2 years into it. The only reason I did was it wasn’t feeding the boards real well anymore but the cut still looked great with no snipe and no tearout as long as you paid attention to the grain direction. With sharp blades you don’t even hear it cut (because the fan for the chip blower is so loud). This is a great little planer. Would I buy it if I ran a professional shop? Probably not but for a weekend warrior like me this is all the planer you could ever ask for. Ditto to all you said. I did find an additional safety feature on mine. The breaker on the planer tripped on me I had been planing red oak steady for about 1/2 hr. After resetting the breaker I turned the planer back on without backing off the cut. The drive belt melted almost instantaneously, that probably saved further damage in the gear box. The replacement belt is spendy $35. I don’t know if Dewalt meant it that way but it worked. I’ve had mine for about ten years. Changed the blades a couple of times. I’ve run many miles of lumber through it, and still works great. Dust collection is great. Thanks for sharing. I agree with everything but the part about the blades being excellent. I was cutting about 250 b.f. between knife changes, and it seemed like a bit much. I switched to the Shelix helical cutterhead and am now very satisfied with the machine. It’s no 20” stationary planer, but it hardly qualifies as a portable planer either. By the way, it’s not the blower that makes all that racket… it is the universal motor and the straight knives whipping through the air like paddles. I took the blower fan off mine, and it made no difference in the noise level so I put it back on. What surprised me the most is the no-load noise level decreased significantly with the Shelix head. Pintodeluxe is right. I disconnected the blower from mine to see if it would lower the noise, and it made no difference. It is mostly the knives, though the universal motor does contribute some. After the DW 735, I had a Rockwell-Invicta 13” with an induction (and therefore much quieter) motor, and it too howled like a banshee. I now have a Jet JJP12 HH combo machine with helical head, and it’s much quieter, though I still use earmuffs because I can’t afford to lose any more hearing. Great review and comments. I just picked up one of these used and look forward to using it. I was doing all my dimensioning by hand before, so this will be a major upgrade. Squirming in my chair trying to decide planner choices. I have Delta lunch box planer and it works. Leaves some snipe on both ends, but satisfactory for $$80 price deal. Use my buddies 15 inch Grizzly and it is really good, stationary machine. Used my friends Dewalt lunch box planer and I was very satisfied. Used a friend’s D375 and it was great. THEN when back and used the Delta lunch with a replacement spiral cutter. It was better than great, and much quieter. So, what to invest in, I think spiral cutter for reduced noise, and less chip out on figured wood. But then out of budget authority from Mrs Banker. This 735 might be good compromise, and then spiral head a few years down the road. Yeah, a spiral (or shelix) is the upgrade to get. If you have a decent base unit (I have a 3HP 15” griz), it’s like night and day. My Griz+shelix is very quiet and cuts super clean. In addition, I can plane highly figured wood that would have had major tear out with the old straight knives. I’ve stuffed some super hard wood (like Jatoba and Rosewood) through it with no problems. Very happy with it. Would never go back to a straight head. Im not a big fan of mine. My blades become gouged easily and it doesn’t plane any thinner than 3/16”. I also think its about 10dB louder than the cheap Delta lunchbox it replaced. I swapped out the standard cutter head and replaced it with a Sheilx cutter head. Made a world of difference. 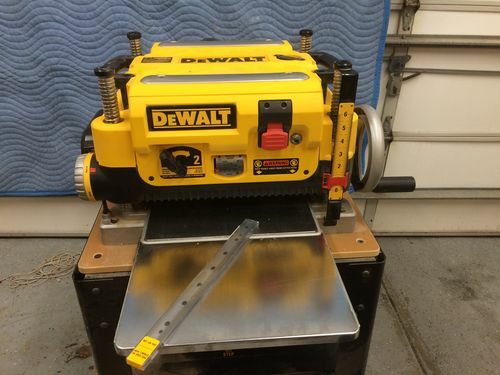 Spendy upgrade but takes the DeWalt to a whole new level. Sound way down, cuts a surface that needs very little sanding, and reduces tearout considerably. The cutters are carbide and last exponentially longer than the standard HSS knives. Sheilx has great instructions on how to do it and it only takes standard tools to get there. If you have the cash and do a lot of planning like I do I highly recommend it. This is a nice review with great comments. However mramseyISU you make no mention of the 2-speed feature of the unit, nor has anyone who commented. Are you using it? Is it valuable to you, particularly regarding figured woods? I appreciate the honesty of Dedvw’s comments. Let’s face it, we do the research and take the plunge to buy a product. From that point our opinion is tainted since we WANT it to be a good product. That said, I have owned the DW735 for over a year and I am basically happy with it. The 2-speed feature was a selling point for me and I do like it. I tend to use the slower speed (more cuts per inch) to make my last one or two passes and it does leave the surface smoother than the faster cut speed. I sold my Makita 2012NB to buy the DeWalt. The Makita was/is a fine tool and I really had no issues with it other than the typical snipe. I was enticed by so many reviews and woodworkers hailing the performance of the DW735. I don’t regret my purchase at all but, other than the chip ejection and 2-speed feature, I feel the Makita was at least equal in performance. To all the guys suggesting the Shelix head, yes that would be amazing to have one of those, just a little hard for me to swallow buying a part that costs just as much as this whole machine did. For that kind of money you’re 2/3 of the way to a big grizzly with a spiral cutter, might as well do that. Lenny, I didn’t mention the 2 speed operation because I don’t really find that it does much for me. Sometimes I’ll run it if I’m having tearout on a gnarly piece of wood but I normally don’t run anything other than oak though it and that’s pretty easy going with the grain normally. Based on Craigs list I shoudl be able to get ~400-450 for it, with the spare knives and extension tables, but I am in Salina, KS. So I have a pretty small pool of potential buyers. To Lenny – I rarely use the higher speed. I always use the 179 cuts per inch not the 90. But I am never ‘Hogging’ a lot of material. Suppose the higher cuts per inch shortens blade life a bit. I have had this planer for five years now and like it. Only problem I have had is , while planning red cedar occasionally a knot comes loose and destroys the plastic chip extracting fan housing. I have repaired and/or replaced it about four times now.